January 10, 2018 – eOriginal, Inc. today announced that the company has been recognized as an industry leader for the second consecutive time in The Aragon Research Globe™ for Digital Transaction Management, 2018: Automate the Enterprise report. Developed by Aragon Research, a technology research and advisory firm, the report is a market evaluation tool for the rapidly evolving digital transaction management (DTM) marketplace and companies that are providing meaningful solutions that are integral for its advancement. “As financial services and other industries continue to adopt innovations, eOriginal remains committed to enabling trusted digital transactions with unprecedented speed and the backing of an ecosystem built on confidence and compliance,” said Brian Madocks, CEO of eOriginal. 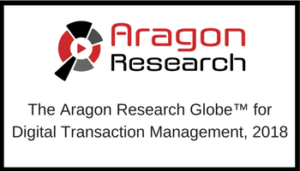 As a trusted DTM provider, eOriginal is recognized by Aragon Research for its asset management and robust transaction services. This recognition comes on the heels of eOriginal’s recent partner integrations with Fannie Mae, Notarize, Quicken Loans and Pavaso—further affirming the company’s central role in the digital transformation of the mortgage industry. “[eOriginal] guarantees trusted transactions of digital financial assets for all parties from the borrower to the secondary market. As such, eOriginal is the system of record for many loan providers, due to its ability to track all aspects of the lifecycle of a digital transaction,” the report states. Through a proven network powered by financial service leaders, the eOriginal platform provides certainty in DTM, specifically in how digital assets are created and maintained, delivering the confidence, visibility and compliance lenders and buyers need. As a pioneer in the space, major financial institutions, leading law firms and credit ratings agencies have validated and rely on eOriginal as a trusted DTM partner.